CAP is famous for making fitness equipment for commercial fitness facilities and individual home owned gyms to fill out a large retail space with the trusted and certified equipment. Though, CAP Barbell is mostly recognized for producing strength training equipment in which the making of one inch or two inch plates are also included along with kettle bells, dumbbells, squat stand and many storage accessories. 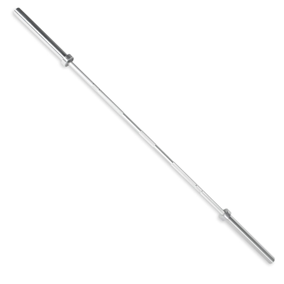 Stainless steel barbells simply out stands rest of the barbells when it comes to durability and functionality. These barbells are very rare to find because of stainless steel which is considered the best yet the most expensive material on the market to prevent rust or dust. Barbells made up of this material needs no major maintenance as their condition and design is always maintained as it was. One of CAP’s stainless steel creation is the CAP Barbell Stainless steel needle bearing Olympic bar. Not only with a sturdy construction and high quality material, this barbell comes with needle bearing too which is one of the features to make it look outstand from the rest. Along with that, this bar comes with a weight of 20 kg which have the capability to withstand weight up to 1500 pounds. The bar has a tensile strength of 190,000 with a finish of bright zinc oxide on it. The length of the barbell is kept very standard along with its dimensions, which is 2200mm long with a sleeve and shaft length of 415 mm and 1310 mm. With a very moderate knurling and dual knurl marks, center knurling is also done on the barbell which is 120 mm in length. 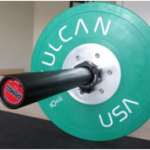 The diameter of the sleeves are kept standard on which two inch Olympic weight plates can fit very easily. 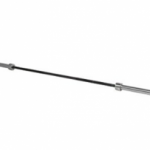 The barbell comes with thirty days money back guarantee and two years manufacturer warranty. 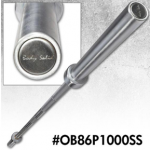 The stainless steel needle bearing Olympic bar by CAP barbells is engineered to withstand high intensity workout and is one of the best choice for professional athletes and weightlifters. The bar is constructed very precisely by Stainless steel, which is considered one of the best fit for Olympic bar due to its extensive durability. The bar consist a weight of 44 pounds which can withstand up to 1500 pounds. The reason because of its massive weight capacity is its tensile strength of 190,000 PSI which is very hard to found on stainless steel barbells. The quality of stainless steel is immensely high on this barbell as it can withstand wear and tear of regular gym abuse. The stainless steel is coated with bright zinc oxide which may not be very attractive coat for barbells. Thus on this barbell it is coated with immense concentration with no chance of rust and chipping. One attraction of this barbell is its five needle bearing on each sleeves. Needle bearing works way better then bushing bar because of its superior construction that makes the sleeves rotatable on the shaft very smoothly and easily. Needle bearings reduces stress and pressure on your wrist by giving a very repetitive motion. On bushing bars, there is a huge chance of no or less spin especially on heavier weight set while in needle bearings, there is no such issue. With these bearing, the whip and spin of the barbell is very comfortable that gives a very impressive touch while performing exercises such as curls, bench press and deadlifts. The length of the bar is 2200mm, having a sleeve length of 415mm and shaft length of 1310mm. 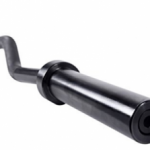 The diameter of the shaft is kept standard to make the barbell easily accessible and adjustable who were using standard barbell in no matter what its quality was. With a diameter of 56 mm, standard weight plates which having a diameter of two inches can fit within very easily. The knurling done on the barbell is very much moderate which I think is very good because most of the weightlifters go for certainly medium depth knurl. The dual knurl marks are with respect to IWF and IPF standard, making your hand easily adjustable on it. This stainless steel barbell also consist of center knurling, which is very a rare stuff to found on barbells. The reason of their uncommonness, is that they tend to injure your neck while performing exercises such as curl. In this barbell, the center knurl is kept very less than moderate, which will prevent your neck from getting injured and will help you to properly adjust on your back, without sliding at the time of performing squat. 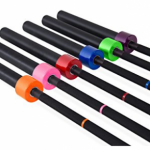 The barbell consist of thirty days money back guarantee along with two year manufacturer warranty that covers all the bends or breaks of the barbell. This gesture by CAP barbell shows how this company is backing up with their product by providing great customer service. The bar comes with a weight of 20 kg. Have the capability to withstand weight up to 1500 pounds. The bar have a tensile strength of 190,000. A finish of bright zinc oxide is done on the barbell. The length of the barbell is 2200mm while the sleeve and shaft length are 415 mm and 1310 mm each. Comes with dual knurl marks with respect to IPF and IWF standard. 120 mm of center knurl is also done on the shaft. 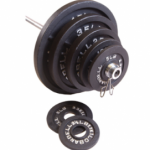 The diameter of the sleeves are kept standard on which two inch Olympic weight plates can fit very easily. 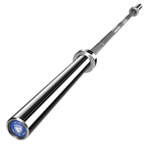 The barbell comes with thirty days money back guarantee and two years manufacturer warranty. In my opinion, the stainless steel needle bearing bar by CAP Barbell, is a type of barbell by which it is not really easy to get rid of it. This extravagant bar is very nice which gives you the exact and better feel than any Olympic bar I’ve worked with. The bar is very durable and can withstand wear and tear without giving bending, breaking or destruction of sleeve plates. The look of the shaft is same from the time I purchased it, same goes for sleeves. The barbell fits really firmly and comfortably on my hands while that moderate knurling doesn’t really damages my surface. As being a professional weight lifter, this bar is recommended mostly for experts or serious intermediate Weightlifters and to the one who are experiences in Cross Fit. If you are intending to purchase this bar for strength training and power lift, with respect to its price tag, this bar is not a right pick to choose. The bar comes with a great spin rotation even at heavier weight sets it rotates with excellent spin. Stainless steel bar is rust, dust and corrosion resistant. A thick layer of bright zinc oxide is used to prevent the sleeves from scratches while loading/unloading. The knurling is moderated which do not damages your hand and can be used without chalk or gloves. The barbell consist of needle bearings, five on each side which gives a great rotation and spin even on heavier weight set. The bar is immensely expensive due to stainless steel and extensive features. Sleeves do not have grooves, which is used to change plates without using of collars. Bright zinc oxide oxidation rate is very high in humid regions.